And now, after spending the last five years developing the most powerful market analysis and trading tool on the market, Tom’s showing readers how to capture gains of 100%… 200%… up to 500% to you today through his remarkable Weekly Money Call tool. Weekly Money Call is Tom’s proprietary system that crunches millions of data points on 200 of the most liquid stocks in the market, and predicts – with pinpoint accuracy – which stocks are about to jump… and highlights ways to trade these jumps for triple-digit gains (or more) in just four days or less. Now, five years ago these trades were impossible. But now, Tom’s showing readers how he uses this tool to capture gains of 100%… 200%… up to 500% every week through his remarkable Weekly Money Call research service. If you’re an Weekly Money Call subscriber, click here to login. If not, see below for more information about Weekly Money Call. Now, I don’t know about you… but I LOVE Mondays. Because I LOVE fast money. You know the sound your phone makes when you get a text message? THAT’S why I’m pretty sure you’re going to end up loving Mondays as much as I do. Any other time of the week, that’s the sound of an ordinary text hitting your phone. A “Money Call” is ready and waiting for you. And it’s the most exciting way to build wealth I’ve ever seen. You won’t believe how easy and fun this is. All you have to do is have your phone handy. In about 4½ minutes… you’re set up with the chance to get rich! And never any later than Friday! That’s right. All within four days or less. Well, let me show you how this works. I sent out a Money Call on May 30 for PowerShares QQQ Trust (QQQ). Your phone would have signaled that Money Call just after noon. And anyone who took 4½ minutes to “answer” that Money Call could have celebrated all weekend with a 63.6% GAIN in five trading days! It’s just that easy. Even for newbies like Lisa Murphy, who left a message about her big score! Just before that, I didn’t issue one Money Call – I issued TWO! The first one, for Raytheon (RTN), went out at 12:15 p.m.
Then I sent out another one, for DeutscheBank (DB), at 12:29 p.m. Anyone who “answered” both of those Money Calls could have pocketed a combined, lightning fast 138.6% PROFIT in TWO days! Even people who’ve never answered a Money Call before in their lives would have been able to MORE THAN DOUBLE their money in just a few hours. Add it all up, and you’d have been looking at a combined 202.2% gain on those three Money Calls that just came through. And $5,000 could have put an incredible $30,110 in your pocket! And what’s really fun is knowing that – even after pocketing all those gains – you’d be barely getting started. Because I send out at least one Money Call almost every single Monday. Heck, just last Thursday, you could have pocketed a 66.7% gain on Merck (MRK) in just three days. 4½ minutes “answering” a Money Call could turn YOUR Monday lunches into “MONEY LUNCHES”! With Money Calls, there’s never any waiting or wondering when your next big weekly windfall opportunity will appear. You can count on hearing that sound every Monday. 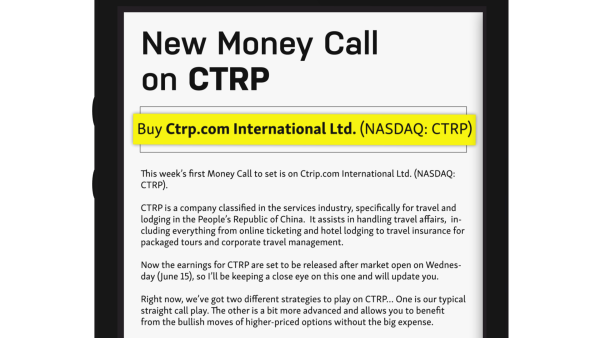 A new Money Call ready to go, available right on your phone or computer, right around lunch time – like clockwork. And collecting gains is so easy, anyone can do it. Once you decide to answer a Money Call, it’s like switching on the autopilot of a money-guided missile. Then start all over again with an exciting new Money Call the next Monday. And every Monday after that. See what I mean about loving Mondays? You could already be finished answering the Money Call. With a move that could DOUBLE YOUR MONEY… THIS WEEK! All right on YOUR phone. That’s what happened when I sent out a Money Call on eBay (EBAY). And at least DOUBLED YOUR MONEY by Wednesday. Just two days! Paul Grady told me he did even better than that. Within one day, it took off like a rocket, and it rewarded everyone who “answered” that Money Call with gains up to 100%. In fact, Gary James told me he pocketed double-digit gains from this Baidu Money Call in just a couple hours. Before that, your Monday lunch hour would have been interrupted around 12:10 p.m. by a Money Call for the S&P 500 ETF (SPY). Within one day, it took off like a rocket. And it rewarded everyone who “answered” that Money Call with gains up to 100%. Making a few keystrokes on your phone while you were finishing up a sandwich… could have put you in position to DOUBLE YOUR MONEY in two days! That’s what Walter Paul was happy to report. The very same day, your phone would have dinged again at 12:30 p.m. That’s when I sent out a second lunchtime Money Call on Morgan Stanley (MS). Taking another 4½ minutes to answer that Money Call… you could have DOUBLED your money in two days like Laura Childs told me she did. Could have MORE THAN DOUBLED YOUR MONEY with a combined 221.3% GAIN! In just two days! In the few hours from Monday lunchtime, to Tuesday afternoon… your money would have literally multiplied right before your eyes. You could have walked away on Tuesday with over $21,000! Now THAT’S a Money Lunch! Of course, I can’t promise you a winner or massive windfall every time you hear the sound of a new Money Call. But you’ll be amazed at how easy and convenient it can be to make money this whole new way. Money Calls can turn your favorite lunch spots, into potential gold mines. As you can see, Money Call is a totally new and unique way to make extraordinary gains… in four days or less… using nothing but your smartphone if you choose. Money Calls can take any place you happen to be enjoying your Monday lunch… and make it feel like a gold mine. For example, you could have been in the middle of a lunch-hour workout when I sent out a Money Call on Starbucks (SBUX). Right there in the gym, you could have taken a four-minute break on your phone to answer that Money Call. And you could have been as happy as Jim Archer, who told me he collected a quick $1,300 profit. The week before, it was around 12:20 p.m. when I sent out a Money Call on Goldman Sachs (GS). Even if you were taking a lunchtime stroll, you could have taken a 4½-minute rest to answer the Money Call right there in the park. And you could have put yourself in position to DOUBLE your money by Friday. Just like Rob Bennett told me he did. A week before that, it was high noon when I sent a Money Call on Facebook (FB). Then 10 minutes later, I sent out another one on Alibaba Group (BABA). You could have “answered” both of those Money Calls on your smartphone while you were taking a leisurely taxi or bus ride across town. And by Friday, you could have pocketed a 102% GAIN on Facebook, PLUS a 106.1% GAIN on BABA. In other words, you could have DOUBLED your money TWICE in that one week! Even if, like Ron Guthry, these were your very first Money Calls. With Money Calls, you can forget about being tied to your computer… because you can set yourself up to make money no matter where you are! Just look how easy these Money Calls work. You get a ding on your smart phone right around noon on Monday. You know it’s time to open your newest Money Call right on your phone (or any internet-connected device). You check out my analysis and easy to follow recommendation. You make a few clicks and boom. By Friday, you could be collecting tons of extra money. And it only takes around 4½ minutes for most people to do this. than anything you’ve ever seen. Now you should know that I refuse to even consider sending out a Money Call, unless there’s an overwhelming probability of at least a 100% gain that same week. That’s what makes answering a Money Call the easiest – and most reliable – way on the planet to make up to DOUBLE your money or more… no later than Friday. And even as fast as one day. And it’s why that text alert sound will have you licking your chops every Monday. You can be poised to pocket MORE profits in one week, than most people make in a whole year. Of course, nobody knows exactly which way the markets are going to go every time. Even if they fall short of my 100% goal, any gains could still be more than you make just about anyplace else. For example, take my Money Call on SPY, the S&P 500 ETF. It hit for 43.6% gains in less than 24 hours. Or my Money Call on Apple (AAPL). It went out around 12:15 p.m.
And you could have been done “answering” that Money Call by 12:20 p.m.
That’s all the time you would have needed to be set up to pocket a hefty 52.4% gain. Not by Friday, but by Thursday. Just three days later. Now while that one didn’t make it to my 100% goal, it’s still a huge win. Heck, most people I know haven’t gained 52% in the last THREE YEARS. Combined! You know how everyone’s excited about the market’s recent record-setting performance? Well, for the S&P 500, that adds up to a total gain of 25.4% in the three years since May of 2014. But just 4½ minutes answering this one “underperforming” Money Call could have put more than TWICE as much profit in your pocket. Not in three years… but in just three days. Now, I sent out another Money Call at 12:49 p.m. the day before. This one was on the Consumer Discretionary ETF (XLY). And answering that Money Call… one that I consider another “underachiever”… could have given you a 62.7% GAIN by Thursday. You’d be laughing all the way to the bank! You’d have a monstrous total gain of 3,260%. That’s $16,300 in yearly profits without ever risking more than $500 a week! See how different this is? Because I set my standards so extraordinarily high, the odds are overwhelmingly in our favor. Now let’s go back one more week and look at what happened. You would have received two more Money Calls during that lunch hour. And in less than nine minutes TOTAL – while sitting at your favorite burger joint – you could have gotten yourself in position for two nice paydays that week. First, the Money Call on AbbVie (ABBV) could have given you a whopping 124% gain by Tuesday. More than DOUBLE YOUR MONEY by the NEXT DAY. That’s just what Chuck Lemer told me he did. And the second Money Call that day… another one on SPY… could have multiplied your money at least 28.3%… NOT in one year, but in just four days! Chris Barty thanked me for helping him do even better (like a lot of people do). This keeps happening week after week. Always in one week or less. Over and over again. And NOBODY else does this. Look how quickly the dollars add up. Now, let me keep things real for a moment. You already know that no method in the world wins every single trade, no matter how fantastic the results have proven to be. That’s true here too. But here’s the thing: Money Calls really can be exactly as lucrative as they sound. The 100% real numbers from my Money Call track record speak for themselves. Every single gain in this presentation is fully documented. Every single quote I’m sharing are real words… from real people… who made real money “answering” Money Calls… in four days or less. So let’s look at those nine Money Calls again. In a way that you could literally take to the bank. But let me show you how much extra money could have been yours… even if you only invested $500 answering each one. You could have had an extra $3,663 cash profit! If you started with a modest $1,000 in each, you could have been looking at $7,326 MORE! Now, what if you transferred just $5,000 in each from the laggards in your portfolio, to try out this new way to make money? Those $5,000 stakes could have meant $36,630 in EXTRA CASH FOR YOU! In just a few months already this year! All in just about 4 ½ minutes at a time. But just look what happens when this multiplies. It’s mind-boggling to think how much extra money you could have already made THIS YEAR! By the middle of May, your single, one-time $500 investment would be worth a jaw-dropping $106,053! Now some may think individual gains like this are impossible. And that used to be true. Until now. 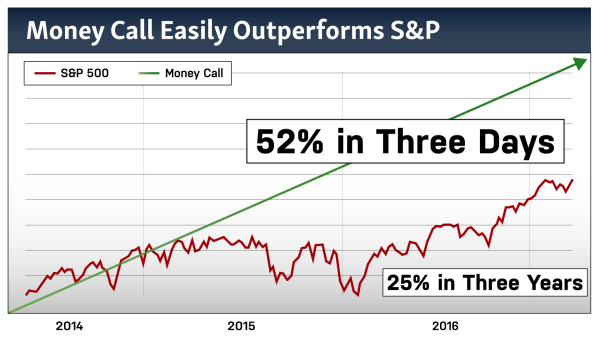 Money Calls can lead to more double- and triple-digit gains, and more quickly, than anything I’ve ever seen. But thanks to my Money Call recommendations, now you really do have the chance to get IN on Monday and OUT with gains by Friday… over and over again. But those trades were there for the taking. The wins don’t lie. And that brings me to another HUGE Money Call difference: You never have to risk a lot of money. You can ALWAYS start with as little as $500. And after you get your first double, you could never have to use your own money again. You can take your original $500 and put it right back in your pocket. Then play with the profits… the house’s money… and roll it over week after week. So, for example’s sake, imagine if you had started with $5,000 instead of $500. Just like that, you could have been sitting on $1,060,530… just over $1 MILLION in just four months! Like a treasure map on your phone. Now, let me put you at ease right away: Answering a Money Call will NOT interrupt your day in any way. In fact, it DOESN’T even involve you actually speaking with anybody. Answering a Money Call is the easiest thing in the world. It’s like following a treasure map, right on your phone. Then decide if you want to follow the money-making steps it lays out for you. A simple move you can make right on your phone if you choose. And in about 4½ -minutes… you’re done. With the profit potential to get rich. By Friday. Here, let me show you one for Ctrip, the travel-planning site. And checked out the new Money Call right on your phone. First, it tells you exactly what to do and why. Next, it tells you exactly what to pay. 3) Buy… but only if the price was no more than $1.79. Answering that Money Call would have put you in position for a 64.8% PROFIT by Thursday. Here’s another one. It went out at 12:20 p.m. the next Monday. No matter where you were at the time… a few moves on your phone would have answered the Money Call for Viacom (VIAB) in about 4½ minutes. And by the next day, you could have DOUBLED YOUR MONEY with a sweet, 100% gain. The very next Monday, starting around 12:10 p.m., you would have received THREE Money Calls. The first one would have guided you to buy United Airlines (UAL). The second one came at around 12:20 p.m. It gave instructions for getting in on Delta Airlines (DAL). Finally, at around 12:30 p.m., your last Money Call that day would have told you to buy American Airlines (AAL). And Delta could have rewarded you with a whopping 128.7% GAIN! All together, those Money Calls could have added up to a 296.8% GAIN for you… in just ONE DAY! Money Calls are my favorite way to keep you ahead of wherever the money is moving. Now let me stop here and point out something very important about these last three Money Calls. Contrary to popular belief, getting rich is NOT dependent on what the economy is doing. And it’s not about what the Fed is doing… or what Europe and China are doing either. Here’s the key to getting rich in three words: Follow the Money. Money is always moving somewhere. Even when the overall economy is down, SOMEONE is making money. But staying on top of money moves these days is not for the faint of heart, and it’s definitely not for yesterday’s tactics and strategies. Money today moves quicker than ever. And it changes direction in the blink of an eye. Traditional indicators – like moving averages, RSI, and various types of “bands” – can’t keep up anymore. By the time these “backward looking” indicators finally spot where the money’s going… it’s already moved again. But what if you could get ahead of the game? What if you could anticipate the moves? And what if you could already be sitting wherever the money is headed THIS WEEK? You would be right where you need to be to make a ton of money. And that’s the EXACT position where Money Calls can guide you every Monday. Think about what a relief that is. You can immediately STOP wasting your time and money chasing last week’s hot tip. You can STOP playing Russian Roulette with your retirement – trying to blindly guess where the money will be moving next. And you can discover trades that are overwhelmingly likely to make you a fortune THIS WEEK… all from Monday to Friday. Like with those last three Money Calls. My system told me that money was moving in the Transportation sector. And we got out before the money moved someplace else. We GAINED 100% in one day on Viacom, and got out. We GAINED 64.8% on Ctrip and got out. The thing is… money moves in different niches like this, week in and week out. And my Money Call system is the only REAL-TIME way to find those fast, weekly movements. And YOU’LL HAVE NO CHOICE BUT TO CASH OUT ANY AVAILABLE GAINS BY FRIDAY with the opportunity to DOUBLE or even TRIPLE YOUR MONEY… or more…. BEFORE the money moves again. Money Calls can help you make more money – week-in and week-out – than anything else I know. No wonder people are going gaga over these Money Calls. There is NOTHING that can guide you to more money, faster and easier than a Money Call. By now, you may want to know why Money Calls work. Why the extraordinary gains just keep pouring in week after week. Well, I have a system. A complex computer program, really. I call it my Channel Collision Indicator. CCI for short. I’ve spent four years, and millions of dollars developing this CCI. It’s based on a virtually invisible aberration that I discovered. A unique convergence of three data channels that’s hidden on just about every stock chart. Let’s take a close look at a recent Money Call I sent out for Raytheon (RTN), and you’ll see how this works. 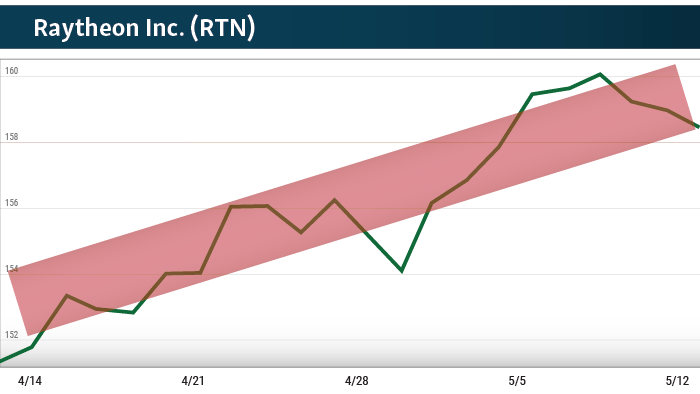 The first thing my Channel Collision Indicator does, is calculate the red, “Gradient Channel.” This channel indicates the stock’s real-time trajectory. Next CCI calculates the yellow, “Launch Channel.” This measures the strength of embedded momentum within the stock. Finally it calculates the green “Inertia Channel.” This may be the most critical of the three channels because it prevents jumping into – or out of – any opportunity too soon. This unique collision pattern almost ALWAYS appears just BEFORE certain stocks can explode with extraordinary gains. Now remember, nobody else on the planet has my Channel Collision Indicator. Nobody else can even see the patterns… let alone know when they collide. So nobody could have sent you a Money Call when this collision pattern appeared on Raytheon. And, if you would have received and answered this Money Call on May 30… you could have DOUBLED your money by the very next day. The thing is, this pattern repeats with uncanny precision. A 48.6% GAIN in two days on Suncor Energy (SU). This is the most “common sense” way to riches – ever. My family and I live in Florida. It’s ranked one of the top six warmest and sunniest states in the entire country. So it might surprise you to know that I’ve become accustomed to carrying an umbrella. Because despite all the sunshine, I’ve plainly seen – over and over again – that from June through August, there’s a pattern. It rains like cats and dogs almost every afternoon. Now, I’m certainly no meteorologist. But I don’t have to be. I’d be crazy NOT to believe it’s going to rain again today. Carrying an umbrella is just common sense based on the pattern I’ve seen. It’s the same whether you’re looking at the weather or traffic or money. When you see the same pattern happening over and over, you don’t have to be an expert. It’s just common sense to do what you can to take advantage of the pattern you see. And that’s exactly what makes my Money Call strategy the most common sense way to potentially build wealth… faster than anything else. Because the moneymaking collision pattern I’ve discovered… that signals every Money Call… it’s as real as it gets. My team and I spent months analyzing and backtesting thousands of potential trades. I’m talking about studying BILLIONS of data points – YEARS of activity on 400 of the most liquid stocks in the market. There’s a TON of money to be made! Answering a Money Call is like my umbrella. It’s the common sense way for YOU to take advantage of this hidden, but undeniable moneymaking pattern. I send you a Money Call. And you even know exactly when to expect the call… while you’re having lunch on Monday. You’re going to hear a tone on your phone. You’re going to check out all the details in my analysis of my system’s latest discovery. You’re set up within 4½ minutes, at most. So what happens by Friday? There’s an overwhelming chance you’re going to double your money. Then do it again the next week… and the next… and the next. Let me show you how quickly and dramatically this common sense system could have multiplied a modest, $1,000 stake, right out of the gate when I sent out a Money Call on Palo Alto Networks (PANW). Taking 4½ minutes out of a lunchtime reading break to answer that Money Call could have DOUBLED your $1,000 into $2,000… in just three days. Just like it did for Pete Masterson. The next week, a Money Call on The Gap (GPS) went out right around noon. And within 4½ minutes, while picking up a few groceries… you could have been set up to multiply your money in record time. In fact, you could have grown that $2,000 into $3,600 the same day. That’s what Jim Mucelli told me he did. The next week’s Money Call was for Valeant Pharmaceuticals (VRX). It went out at 12:40 p.m.
You could have pulled out your smartphone and answered that Money Call while sipping drinks by the pool. And just three days later, turned your $3,600 into $7,498. You could have multiplied every dollar more than SEVEN TIMES! Instead of $1,000… you could have had $7,498! Instead of $5,000… you could have had $37,490! And if you started the month with $10,000… you could have ended it with a whopping $74,980! But if that’s not common sense investing, I don’t know what is. Remember… these individual gains aren’t from testing like you’ve probably seen from other research services. Money Call is NOT some wild, unproven theory. These Money Calls really went out! Every single gain… everything I’ve shown you in this presentation… is fully documented. Not one in a thousand people knows about this! Don’t worry that you’re the only one missing out on these incredible, fast gains. Almost everybody is. Even bankers, traders, and hedge fund managers don’t know how to spot the patterns behind these Money Calls. Remember, my CCI tool is the ONLY thing in the world that finds and leverages these hidden collision patterns in REAL TIME. In perfect time for you to get IN on these exciting new Money Calls on Monday… and CASH OUT by Friday. Best of all, you never have to break the bank to answer any Money Call. I promise you’ll be able to get in on every Money Call play for $500 or less. 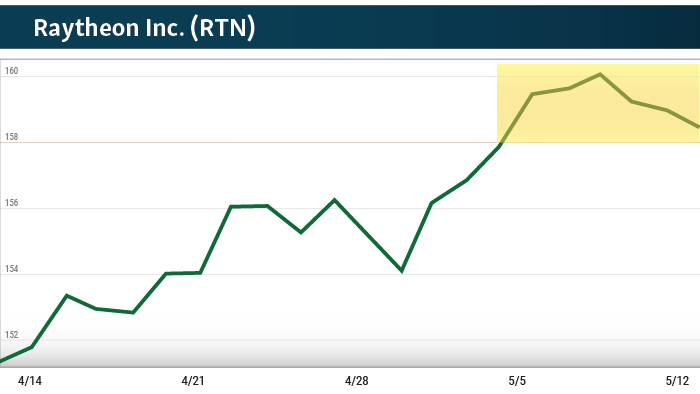 A 106.9% GAIN in three days on Palo Alto Network (PANW). Now on rare occasion we’ll hold on to something a bit longer than four days. But these are the kinds of gains most people may not earn in months or years… all on some of the biggest, most liquid companies on the planet… so we think that they’re sometimes worth the wait. But by simply answering the Money Calls… gains like these could be lining your pockets in just four days or less. Over and over again. How your money could grow scary big THIS YEAR. And 100.0% PROFIT in two days on eBay (EBAY). Barely into the first six months of 2017, the actual winning Money Call trade recommendations added up to a total of 1,144%. It’s crazy! The thing is, because you can expect to get a Money Call every week, the money can get scary big. If you were to invest just $500 each week… and pocket my average winning return… you would have $13,520 PROFIT in one year. But what if instead of pocketing your weekly profits in this scenario, you reinvested them each week? And, taking it a step even further back, what if you only do one fourth as well as my winning average? After 52 weeks, your single $500 investment would still explode into an incredible $33,106 PROFIT. What if you just took a single $5,000 from the underachievers in your portfolio, to see if Money Calls could do any better? You take that $5,000 and use it to answer a Money Call. And when you double your money, you take your investment totally off the table. Put it right back in your pocket. You’ve only risked $5,000 dollars one time. And you’re never investing your own money again. You’re on easy street. You’re playing with the house’s money. And you’re going to have a ball! You take those profits, invest it in the winners, and roll it over again and again and again. And what happens after one year? You could be sitting on $331,065! I told you this was scary big! That’s an exceptional scenario, no doubt. No one ever hits only winning trades. But the potential here is undeniable. You can get rich this way… without ANY previous experience at all. Trading with my Money Calls as a guide can actually MINIMIZE risk and MAXIMIZE gains in five critical ways. First of all, you can be SECURE knowing that my Money Call alerts will ONLY recommend trades on the biggest, most liquid companies. So you’ll NEVER be risking your retirement money on small stocks that might give you a one-in-a-million chance of hitting it big… like you see in so many other research services that never deliver. Second, Money Call trades are AFFORDABLE. I want you to have the chance to experience the fun of pocketing extraordinary winners week after week, without already being rich. So I make sure every Money Call can be answered with as little as $500 or less. Third, every Money Call can give you EXPONENTIAL power over your money. You’ll only get a Money Call when I’m projecting a 100% gain or more within four days. Fourth, Money Call trades are REQUIRED to pay any gains by Friday. So once you answer the Money Call, there’s nothing you need to track or remember on your own. So when a trade hits, you never have to worry about missing a payday. Finally, this is as close to a WORRY-FREE way to build wealth as you get. No matter where you are… you can answer every Money Call in 4½ minutes or less, right on your phone. Because I post all the Money Calls on a special website that you can easily access from any device. And since I spell out exactly what to do… it’s almost impossible to make a mistake. A child could answer a Money Call, place the trades, and be in position to make tons of money. This is undeniably the fastest, easiest way to make money, ever. All you need to do is decide whether to take action. Then follow my easy, one-step directions. And even if you’ve never made a trade before in your life… Money Calls could be your ticket to pocketing incredible gains week after week. Plain and simple, this is one helluva fun way to make money. In fact, this could be the easiest money you’re ever going to make in your life! And it can start right now. You don’t have to wait one more minute. I’m already working on your very first Money Call. And in just 4½ minutes starting on Monday, you could be thousands of dollars richer by Friday. For you, it’s a quick and easy process: Just take 4½ minutes to answer a Money Call around lunchtime every Monday. But behind the scenes, I work around the clock to unearth the collision patterns that could double your money in one week. EVERY DAY – The real-time network in my CCI tool crunches through billions of data points. That’s what it takes to find the unique collision patterns that are driving the market moves THIS WEEK. EVERY WEEKEND – My system scours the best stocks, ETFs, and indices in the market. And it only selects those that perfectly match up with this week’s specific collision patterns – ones statistically likely to make extraordinary profit THIS WEEK. EVERY MONDAY MORNING – Where my CCI tool leaves off… I’m just getting started. I take each of those top picks and run them through my personal wringer of analytics and expertise. And that’s when I come up with one or two unique situations that I expect could quickly turn every $500 invested into as much as $1,000 or more by FRIDAY. Only then will you get a Money Call alert with all the details and research from me. Everything you need to take advantage of opportunities for extraordinary one-week gains you simply can’t get anywhere else. Fast, completely new and unique gain opportunities you can set your watch by. What’s really exciting is how easily you can make these super-fast gains… at a VERY comfortable pace. There’s nothing rushed or difficult at all about learning how to grow richer with Money Calls. In fact, this is such a reliable way to build your wealth, you can practically set your watch by it. Every Monday when a new Money Call goes out… that’s another exciting new opportunity for you to score big by Friday. And you can count on hearing the next ding on your phone next Monday at lunchtime. Of course, we don’t send these Money Calls to just anybody. The ONLY people who get these Money Calls are members of my unique research service called, Weekly Money Call. Admittedly, it’s a very small group. It has to be. With all the coaching, guidance and intricate attention to detail I provide my group of members, I simply refuse to spread myself too thin. And frankly, 30 years of experience has taught me that not everyone has what it takes to belong anyway. For example, being able to answer these Money Calls in a timely manner is critical for those who decide to invest. And some people may not want to do that. It takes real commitment to get in on Monday week after week… for the chance to pocket profits by Friday. But some people don’t like to commit. I’ve also met people who actually feel guilty about being able to make more gains in one week than many of their friends have made in three years. Folks like that would definitely be uncomfortable taking advantage of Money Call’s consistent weekly windfall opportunities. And surprisingly, some people are embarrassed to make “too much money”… whatever that is. Others are simply afraid to try new or unfamiliar ways to build wealth. And being able to double your money in one week or less with Money Call recommendations is as new and unique as it gets. Following my research has never been so easy. And we need your phone number to get the Money Call text notification to you as fast as possible. Of course, you don’t have to give us your number. That’s 100% up to you. You can still join my research service. But then you might be last to know about every Money Call. So if you don’t want to provide your number, this may not be right for you. Like I said, members become part of a tight-knit group. The plain truth is my Weekly Money Call is going to be most beneficial for people who are dead serious about learning how to pocket quick gains in one week – over and over again. This is your invitation to join them. In fact, this may be your ONLY opportunity to become one of the few people with the chance to cash in on every windfall Money Call uncovers for the next year! I’m basically giving you my life’s work, so it’s not cheap to get in. The retail price of an annual subscription to my Weekly Money Call is $4,995. And it sells out quickly at that price. You’ve just seen dozens of Money Calls that could have turned every $500 into $800… $1,000… even $1,500 or more! Over and over again. I’ve already shown you how it would have been possible to make over $100,000 with Money Calls in the last six months alone. I’ve even had offers from high-end investors wanting to pay me $30,000… $40,000… even $50,000 a year for access to my systems, tools, and investing expertise. So it’s clear that my Weekly Money Call research service is easily worth much more than $4,995. Truth is you could easily cover that answering your very first Money Call. Because I’m prepared to give you a full year of my Weekly Money Call research service at just a fraction of the retail cost. And I mean a fraction. I’m talking a HUGE, 60% discount OFF the retail price! That means, as one of my newest potential Weekly Money Call millionaires, you’ll pay just $1,995 for 12 full months – at least 52 Money Calls with money-doubling opportunities you can’t find anywhere else. It doesn’t matter whether you’re a seasoned trader or brand new to all this. Understanding the revolutionary concepts behind every Money Call can give you a giant advantage in every trade you choose to make. My Weekly Money Call is already helping people all over the world pocket incredible new gains fast. My Exclusive $15,000 Commitment to YOUR Success. In my 30-year financial career, I’ve done it all. Everything from being a trader at the American Stock Exchange (AMEX)… to being co-founder of one of the world’s leading and most trusted financial education companies. Chances are you’ve even read one of my best-selling books on market-beating strategies. And Charles Schwab paid millions of dollars just to get the revolutionary programming behind my work. Now I’ve put all my experience and expertise together to make Weekly Money Call the most valuable research service on the planet. In addition to your regular Monday Money Call, you can count on real-time alerts. The second I release an alert that it’s time to close out a trade recommendation or capture profits, you’ll hear that ding on your phone again letting you know it’s ready. You’ll always know exactly what’s going on with every Money Call opportunity… and what to do about it. No worries and no guessing. Your membership also entitles you to 24/7 Web Site Resources. This password-restricted, members-only site gives you a wealth of up-to-the-minute information and trading resources. This is where I post every Money Call – each new trade recommendation and action alert – as soon as it’s released. So you’ll always have complete access (even if you choose not to receive my texts). And this next benefit may be the best of all. And the fastest way to grow to a million dollars. PLUS in each month’s group coaching session I’m going to give participants even more opportunities to make extraordinary profits in one week or less. I’m talking about revealing at least three or four bonus Money Call trade recommendations. And every single one could add tens of thousands of dollars more to your bottom line. Add it up and you can see why this is the very best deal I’ve ever offered anyone. Plus step-by-step guidance to my exclusive Money Calls that can help you put thousands of dollars in your pocket every week. That’s my $15,000 commitment to your success! And it’s all yours… but only if you join right now. TODAY. Your one-of-a-kind, 2,200% Total Profit Guarantee. Now, I understand that this whole idea of Money Calls may be new to you. It’s hard to imagine that by taking just 4½ minutes to answer a Money Call on your phone, you can be in position to pocket extraordinary gains by Friday. But there’s no denying it. Money Call is on an incredible roll. You’ve just seen the proof… over and over. I’ve revealed the hidden pattern. You’ve seen how easy this is. I’ve shown you why I never recommend a trade unless it has the potential to make at least 100% profit. And I’ve shown you how this strategy can consistently lead to winner after winner… week after week. In fact, adding up every single trade, Weekly Money Call is on track to net over 1,000% in total gains this year. But with the momentum I’m seeing, that’s just a drop in the bucket. I’m so confident that Weekly Money Call is going to make you a fortune that I’m going to take things one giant step further. I’m going to make this decision ridiculously easy for you… with my one-of-a-kind, 2,200% Total Profit Guarantee. I GUARANTEE that in the next 12 months – across all our trades, including winners and losers – Weekly Money Call will add up to at least 2,200% in total gains! That’s DOUBLE what we’re on track to do right now. And if my track record shows I didn’t deliver, just call my team. I’ll give you a full refund of your subscription fee – every cent – no matter how much money you’ve made so far. If my track record for any reason fails to hand you the opportunity for 2,200% profits in the next 12 months… I’ll work for you for FREE for another full year after that! So how can I make such an incredible promise? Everything you’ve seen today is based on my actual track record. It could mean huge dollars for you… but it’s also an EASY guarantee for me to make. And you’ll never, ever find anything like it… anywhere else. Here’s the thing: This Premier Member lowest price offer and 2,200% Total Profit Guarantee will only be available for a limited time. Once it goes away, the price goes up – substantially – and you may never have this special opportunity again. I suggest you act right now. What could YOUR wealth look like one week from today? 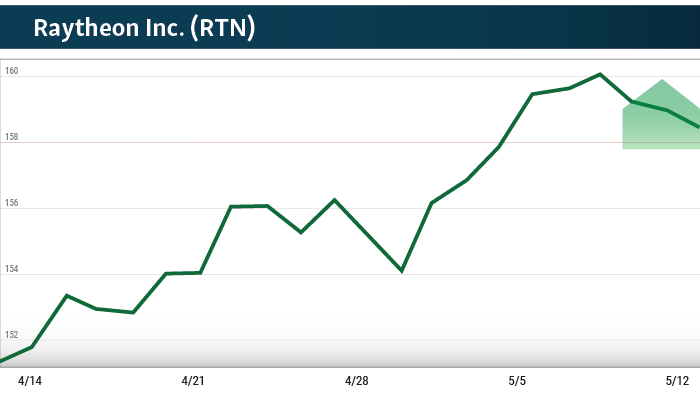 A 108.3% in three days on Valeant Pharmaceuticals (VRX). Because the evidence could be busting out of your wallet. Now it’s time to bring this all home – right to YOUR bottom line. I plan on sending out another Money Call around noon on Monday, whether you take me up on this offer or not. Or you could keep going the way you are. Let’s look at the facts one more time. This has to be the easiest decision you’ve faced in a long time. Money Calls really are amazing… and you don’t have to take my word for it. All you need to do is click the button below to review all the details for yourself. Remember, this isn’t going to take a year, a quarter, or even a month. You could start seeing extra gains in your account by this time next Friday. By now it’s crystal clear how powerful Money Calls can be. But you should know that they do have one limitation: Too much simultaneous activity could affect gains. So everyone who wants to become a Weekly Money Call Premier Member for the chance to follow every Money Call to potentially life-changing profits may NOT be able to get in. And this may be your ONLY invitation to join. Plus, remember, today’s lowest ever Premier Member discount will only be available for a limited time. To ensure you don’t miss out on the opportunity to double your money with my next Monday Money Call, you really should click on the button below right now. Or, if you prefer to speak with someone over the phone, just call 1.855.509.6600 (1.443.353.4770 for international callers) and mention your Priority code: WWCKU238. My name is Tom Gentile.